What is Christmas without mince-pies? Mince-pies are a British Christmas Favorite. So for all those who maybe have not heard of mincepies … no, they do not contain any meat whatsoever! They are lovely mini sweet pies filled with a mixture of dried fruit, laced with spices, which mixture has been preserved in alcohol. Mum made mince-pies every Christmas. The mincemeat was usually shop bought which still tasted great, apart from convenient. Here in Italy, I do not find mincemeat, so I decided to make it myself, at least, this Christmas I can again enjoy some lovely homemade mince pies! 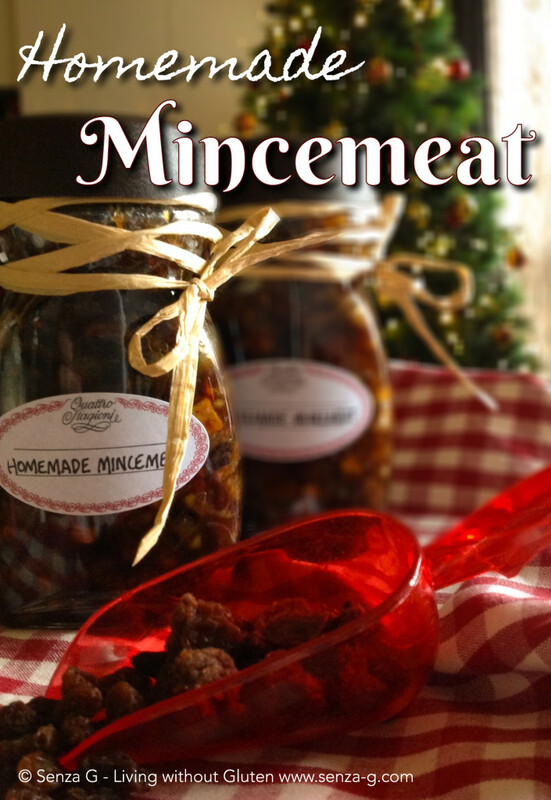 This is an adapted recipe I used to make my mincemeat. I halved the recipe and made two nescafe jars full. I will later be posting the full recipe for the mince pies, when my mincemeat is ripe and ready! Place all the ingredients with the exception of the brandy, into a large pan and heat until butter melts. Simmer gently for about 10 minutes, giving it a stir occasionally. Allow the mix to cool completely before adding the brandy. In the meantime you can sterilize the jars. Wash them and place on a baking sheet and in the oven. Switch on the oven at 150C and leave the jars in it for about 20 minutes. Leave them to cool completely. Spoon the cooled mixture in the jars. Put a small piece of cling film at the mouth of the jar and then seal tightly and store in a cool, dark place. You can use the mincemeat within 3 to 4 weeks.